US Secretary of State John Kerry. Click enlarge. Kerry defended the deal during the Ignatius Forum in Washington, saying Prime Minister Benjamin Netanyahu was “genuinely agitating towards action,” before he struck the accord with Tehran. Kerry said when he was chairman of the Senate Foreign Relations Committee, he met with Saudi King Abdullah, Egyptian President Hosni Mubarak and Netanyahu, who all lobbied for military action. But Kerry said that was “a trap” since the Arab countries would have publicly criticized the US if it bombed Iran. It was not clear when the conversations took place. Kerry chaired the Senate panel from 2009 to early 2013. Mubarak was deposed in February 2011. Kerry, one of the main architects of the deal, said he doesn’t know whether Iran will resume pursuing a nuclear weapon in 10 to 15 years after restrictions in the deal sunset. But he said it was the best deal the US could get and made the Middle East safer as well as heading off a nuclear arms race in the region. “Without exaggeration, the likelihood is very high that we would have been in a conflict,” without a deal, he said. He criticized US President Donald Trump for telling Congress to try to fix the agreement and said he had “polluted the water” of legitimate diplomacy by vocally criticizing the deal while campaigning. He added that UN restrictions on missile development were snuck in by US ambassador Samantha Power and were only included because nobody noticed. Netanyahu in the past issued threatening hints about Israeli plans to bomb Iran’s nuclear installations and was reportedly close to doing so in 2013. 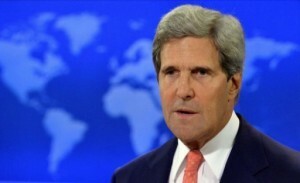 Experts advised that Israel would need US help to effectively carry out the operation. He has been a vociferous critic of the nuclear deal, which rolls back Iran’s nuclear program in exchange for sanctions relief.